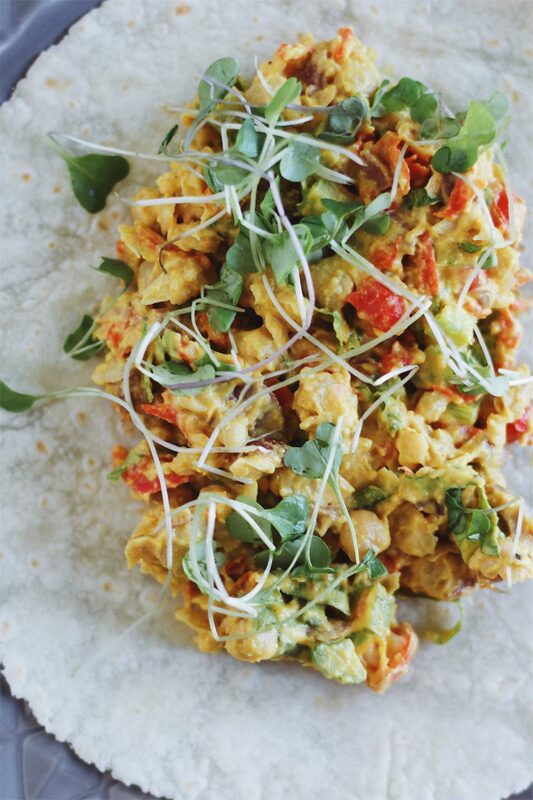 These Smashed Chickpea and Goat Cheese Wraps are the perfect healthy weekday lunch. Great for meal prepping, these wraps are filled with fiber, protein, greens, and a little crunch. Personally, I am a huge fan of chickpeas. There’s so much to love. They are incredibly versatile. 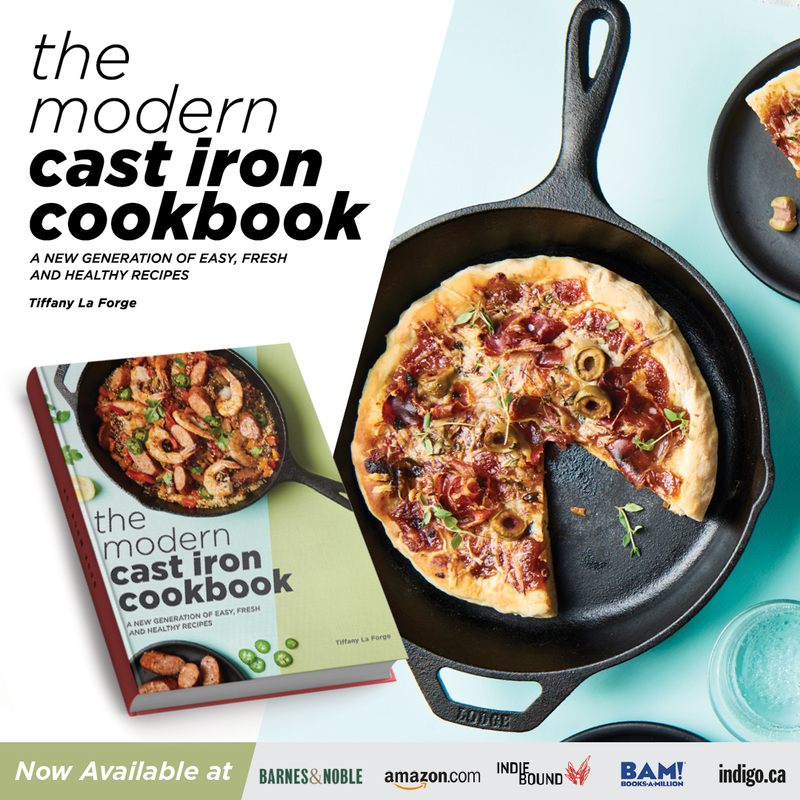 From crispy spiced chickpeas to add crunch and texture to salads to falafels to hummus to soups. We live around the corner from an amazing healthy convenience store. Think: super mini Whole Foods. 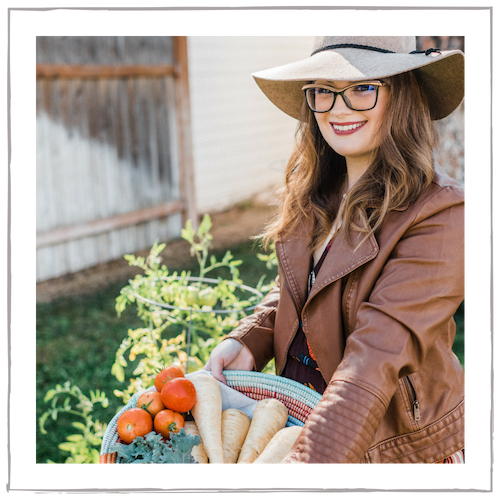 They have an incredible beer and wine selection, a great bakery case of local goodies, produce, cheese, prepared foods, grocery, and frozen foods. They even have an espresso bar and beer and kombucha on tap. It’s small, but mighty. It even has a gas station! In the summer, they have live music outside. The store is big into wine and offers lots of wine classes and tastings, and even have their own bottled wines. They have this incredible champagne and it’s only $11. And champagne is my favorite. My go-to this summer was getting a bottle of that to split and sitting outside listening to music. Pure heaven. They have a great prepared foods selection—hot foods, salads, soups, sandwiches, mac and cheese, desserts galore. 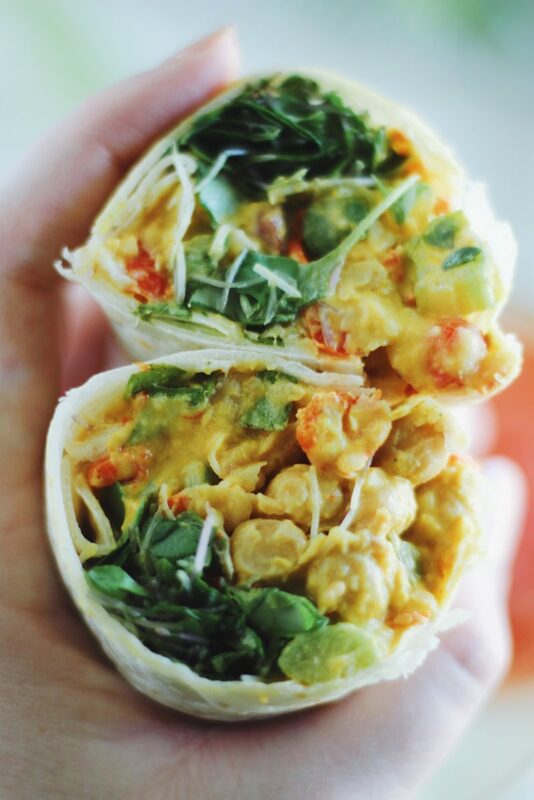 My favorite sandwich of theirs is a smashed chickpea salad wrap. It’s filled with olives, capers, goat cheese, and romaine lettuce. It’s simple and delicious. And it was my other go-to this summer alongside that tasty bubbly. And it’s where I got the inspiration from for these Smashed Chickpea and Goat Cheese Wraps. 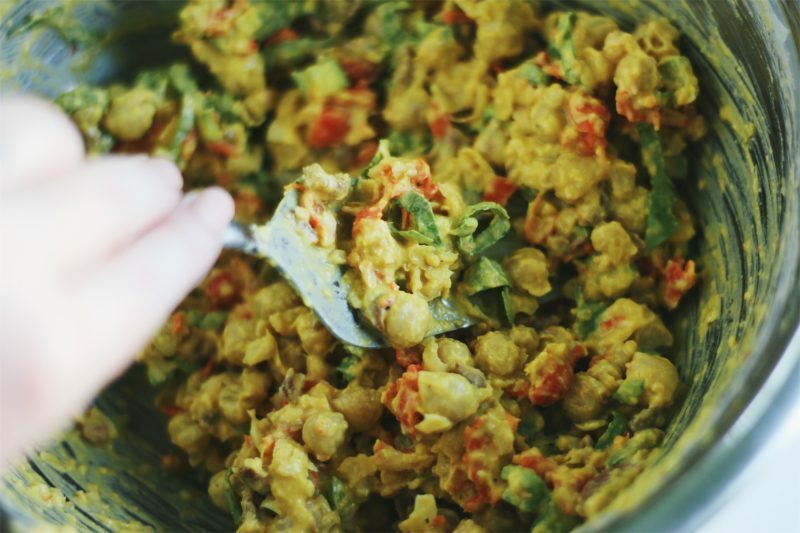 Chickpeas are also pretty awesome for several other reasons. They’re very high in fiber, protein, manganese, folate, copper, and iron. Chickpeas are an excellent source of plant-based protein at over 14 grams of protein per cup. One cup of these tasty little legumes grant you half of your daily recommended amount of fiber. Since they contain both soluble and insoluble fiber, they also aid in lowering cholesterol and making you feel fuller for longer. Full of antioxidants, they’re wonderful for digestive and heart health. 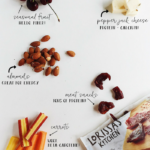 These Smashed Chickpea and Goat Cheese Wraps also make great meal-prep. They’re filled with chickpeas, kalamata olives, roasted red peppers, celery, goat cheese, fresh basil, lemon, turmeric, and micogreens. They have a nice balance of texture, color, and crunch. 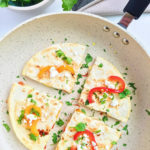 I like to use gluten-free wraps or veggie wraps, but pita or whole-grain bread works just as well. You could also just eat the salad as-is, no wrap needed! 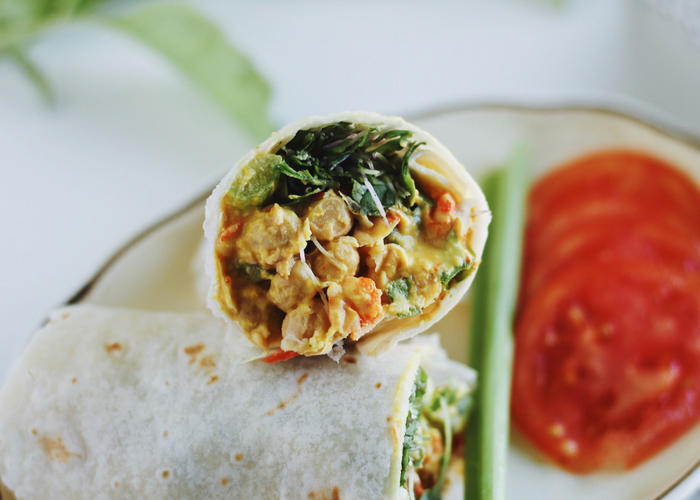 I hope that you can add these Smashed Chickpea and Goat Cheese Wraps to your lunch repertoire! Are you a fan of chickpeas? What’s your favorite kind of wrap? Let us know in the comments below. 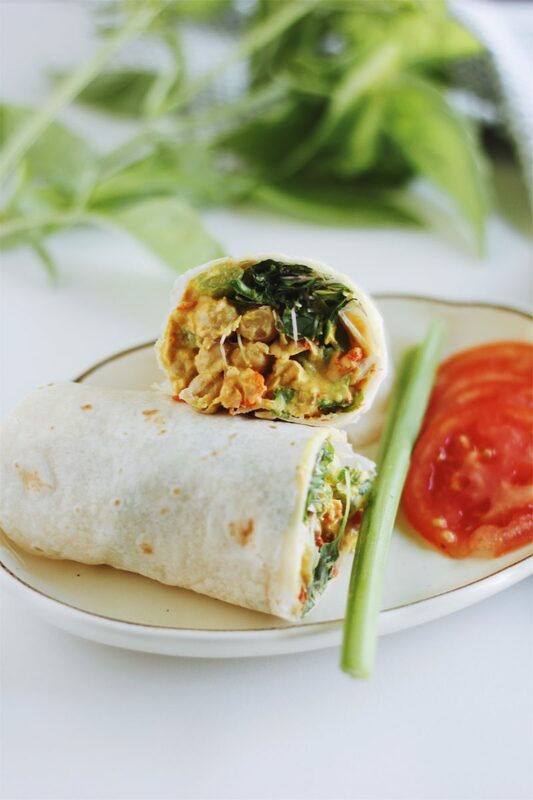 These Smashed Chickpea and Goat Cheese Wraps are the perfect healthy weekday lunch! Great for meal prepping, these wraps are filled with fiber, protein, greens, and a little crunch. Wrap or bread of choice: gluten-free wraps, whole-grain bread, pita, tortilla, etc. 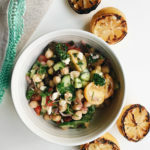 In a medium-sized bowl, lightly smash the chickpeas with the olive oil, sea salt, and pepper using the back of a large fork or potato masher. Keep a fourth of the chickpeas whole. Mix in the olives, red peppers, celery, lemon juice, lemon zest, basil, and turmeric. Gently fold in the goat cheese crumbles. 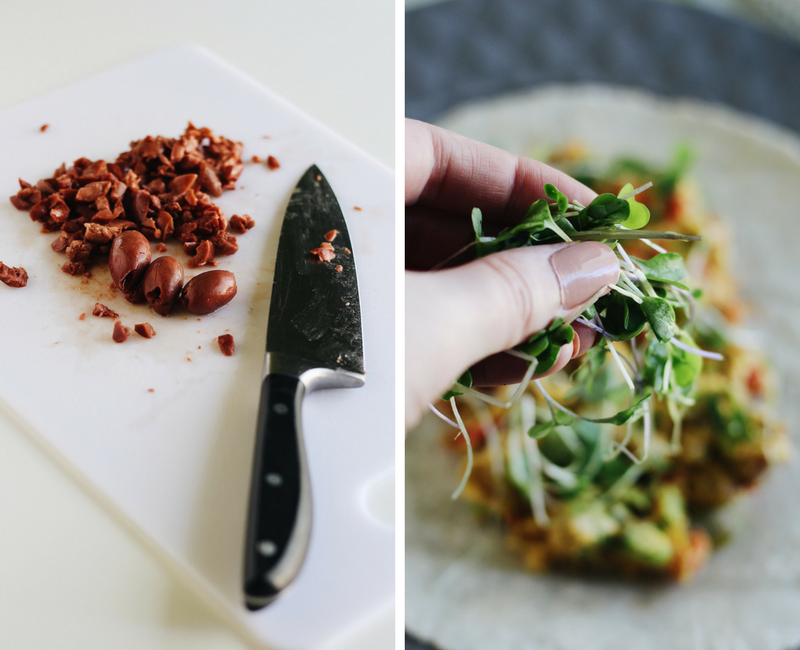 Spread the chickpea salad on your wrap, bread, or pita of choice and top with a heaping handful of microgreens or sprouts. Could you tell me more about this little store you speak of? I’m part of a local organization to bring back life to cities and this sounds like the perfect shop for one town. I’d love to learn more about this place! I’m a sucker for anything chickpea related, so I’m already on board with this one. This looks healthy and delicious and now I really really want one haha. Yuuuum! Will definatly veganize this recipe! Thanks for the inspiration! These wraps look amazing! Pinning to make this later! 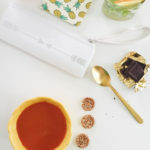 These wraps look fabulous and making me hungry. The chickpeas remind me of an Indian dish called choole. What a fantastic recipe. 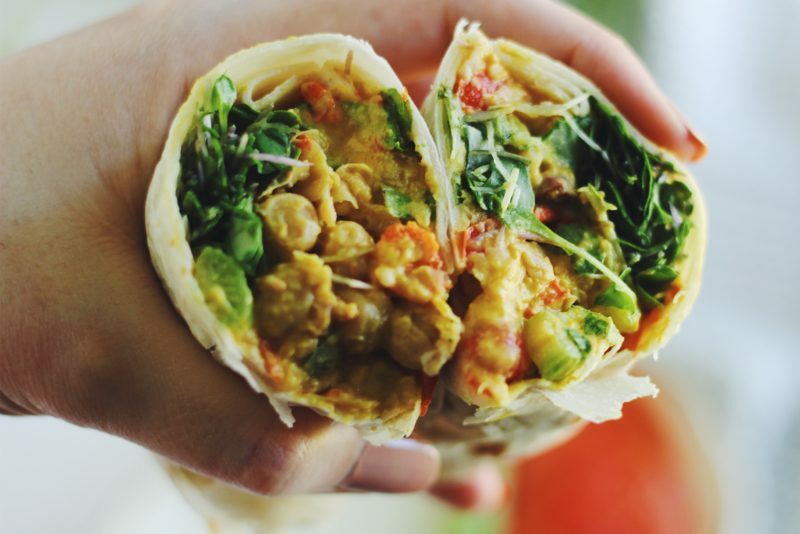 We LOVE wraps…for lunch, brunch and dinner. 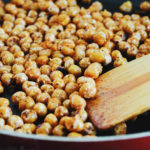 I always have chickpeas in the house….and don’t even get me started on goat cheese…a staple too!! 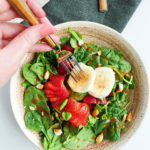 Who needs takeout on a busy day when you can make this at home in a flash!! I am a fan of chickpeas too except I never, ever make anything with them! But I always order things with them whenever I go out! 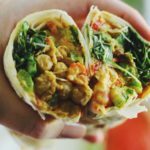 These wraps look just wonderful and they inspire me to try actually using chickpeas at home!